With all of the moving services you need, the Dixon Movers from Meathead Movers can't wait to help you get into your new home. Our clean-cut student-athlete movers are dedicated to fulfilling all your moving needs efficiently. 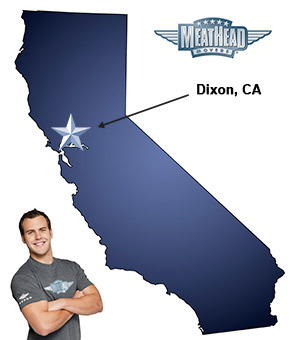 Welcome to Meathead Movers of Dixon! If you are moving to or from anywhere in Dixon, the Dixon movers at Meathead Movers should be at the top of your list to help you out. Our moving company specializes in local, long-distance, and commercial moves to, from, and within California. We also provide reliable packing, storage, on-site relocations, and our distinctive moving concierge service. Dixon is a beautiful small town located in the heart of Solano county, just 23 miles from California’s Capital, Sacramento! The town’s rich history began in 1852 as a result of the California Gold Rush. It also has an interesting history with something a little more prehistoric. The town was once the home of Dixie the dinosaur, a prominent 50-foot-tall and 71-foot-long Brachiosaurus. Unfortunately, Dixie was moved in 1996, and was ultimately destroyed in a fire. Besides previously being home to a giant dinosaur, Dixon also proudly hosts the May Fair, which brings people from all over the area for an event filled with fun and excitement. All our professionally trained student-athlete Dixon movers are thoroughly screened before their first move. With branches throughout California, we are your one-stop resource for all your moving needs, no matter where your move takes you. In fact, you can see what your neighbors have to say about our Dixon movers. With our 100% satisfaction guarantee, the only thing you have to lose is the stress that comes from moving! So contact us today for a free moving quote and to learn how we can help you on your next move! Moving to Dixon? Here are some helpful resources. Davis Waste Removal Company Inc.